One of the strengths of Kolibri Systems is its integrated connection with your Radio communications systems. Our Media Server seamlessly connects with any manufacturer’s network. Users can even mix diverse networks and connect (dispatch) several users or groups from different networks. 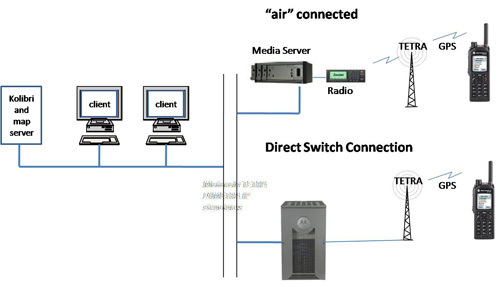 When using a direct switch the connection is made through IP. The advantage of this is that it does not overload the capacity of the mobile network. In addition, a variety of extra functionality becomes available, which can be used within the different applications. Kolibri Systems can provide a gateway for multiple clients to connect to your Switch without having access to the information of other clients. This facilitates the effective management of a multi-customer environment and provides an XML-interface to such customers. KoliLink is an open interface.